No other food exemplifies America and its plentiful bounty like corn. This is the second in a series of articles that explores the history and culinary uses of this versatile grain. Thousands of years before Europeans first landed on the shores of the New World, corn had become a staple food of Native Americans. Among the many ways they used corn, one of the most important was grinding it into a coarse meal which was then used to make pone, a flat bread baked in ashes, drinks such as Atole, and Chicha, and a thick cereal known simply as corn mush or Indian mush. Later, early British Colonists adapted their traditional “hasty pudding” into a corn version called Indian pudding, a dessert still very popular in New England. When the Europeans first came to America, the Native Americans not only taught them how to grow corn, but how to grind and prepare it as well. Much of today’s Southern cuisine stems from recipes learned from the Cherokee, Chickasaw, Choctaw, and Creek, including those that incorporated cornmeal. Originally the Indians ground their corn by hand using mortars and pestles. Still used today by many culinarians, a mortar is a bowl, usually made of stone, wood, or other hard material, designed to hold whatever substance is to be ground (in this case dried corn). The pestle is a heavy, blunt, club-like stick or another stone used to do the crushing. Mortars and pestles constructed by Native Americans were as varied as the tribes who used them. The Caddo and Cherokee fashioned their mortars out of thick tree trunks and used a heavy stick about the size of a baseball bat to pound the corn. Some of the Southwestern Tribes used large rocks with a natural depression for the matate (mortar) and a smaller stone tool for the mano (pestle). The first American gristmill (corn mill) on record was built in 1634 in the colony of New Amsterdam (what is now New York), although the Virginia Company records made reference to a water-powered mill being constructed in 1621 in present day North Carolina. Much like a community barn raising, the local farmers and villagers usually helped the miller construct these mills to ensure a facility within one day’s travel from their farms in which to have their corn (and sometimes other grains) ground into meal or flour. In lieu of a monetary fee for his services, the miller received a small percentage of the finished product called the “miller’s toll.” This “toll” was then sold or traded by the miller for goods he and his family might need. The gristmills also became social centers–a gathering place to catch the latest gossip with friends and neighboring farmers as they waited for their corn and grain to be ground. Newspapers would post their latest issue on the side of the mill, and children would play or swim and fish in the millpond. 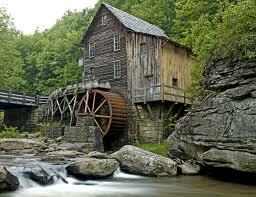 In 1850, more than one hundred thousand such mills dotted American’s countryside. But by the century’s end the efficiency of steam had replaced many of the water-powered mills. And by the early 1900s, these small independent stone-grinding mills could no longer compete with the heavy steel and iron rollers of the larger, more efficient gas–and electric–powered mills. Today, there are less than one thousand gristmills across the country. While many of these have been restored as tourist attractions and for other uses, a few others, such as Jenny Grist Mill, build in 1636 by John Jenney, still operate. Both Native Americans and European colonists recognized the many uses of cornmeal, as well as the nourishment and energy its provided. Here is a brief description of some of the foods, past and present, made possible by cornmeal. Indian Muffins: This recipe from The Kentucky Housewife, a 1839 cookbook compiled by Mrs. Lettice Bryan, is one of seventeen bread, cake, and pudding recipes using Indian corn meal, and the closest to today’s classic cornbread. Beat five eggs light, stir them into a quart of milk with a small handful of flour and a tea-spoonful of salt; then stir in as much fine Indian meal as will make a tolerably thick batter. Having buttered some little scolloped muffin pans, place them in an oven that is moderately heated, put in each a small ladleful of the batter and bake them a nice brown; then take them from the pans, arrange them neatly in a plate, lay on the top of each a slice of firm butter, and eat them warm. Anadama Bread: As the story goes, a New England sea captain’s wife, Anna, was well known for this sweet, cornmeal and molasses bread. Upon her death he had put on her tombstone, “Anna was a lovely bride, but Anna, damn’er, up and died.” Thus the recipe’s name. In a bowl, whisk together one-quarter ounce of dry yeast and two cups of warm water; let stand about ten minutes, until frothy. 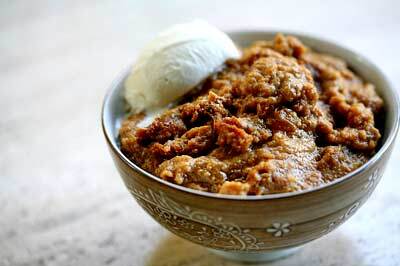 Beat in the three-quarter cup of cornmeal, half cup dark molasses, six tablespoons soft butter and one teaspoon salt. Slowly add five and one-half cups bread flour and continue to beat until a moderately stiff dough forms. Turn dough out onto a floured surface; knead until smooth and elastic. Place dough into a large bowl, coating all sides with oil. Cover with damp towel and let rise until doubled in size. Punch dough down, divide in half, cover and let rest for ten minutes. Shape into two balls, place each in a buttered round baking pan and flatten. Cover and let rise until almost doubled in size. Bake for 25 to 30 minutes in a preheated 375 degree oven. Remove from pans and serve. 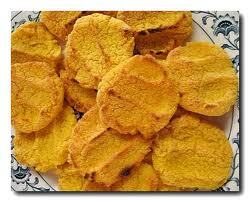 Corn Pone: This traditional Southern dish is, simply speaking, cornbread without the eggs or milk. Also sometimes referred to as “hoecakes” or “Johnnycakes,” corn pones are fried in fat in an iron pan over an open fire, pancake style. Corn Meal Dumplings: Another traditional Southern dish similar to a hush puppy that has been dropped into boiling chicken or turnip greens liquid to cook, rather than being fried. Cornmeal Mush: Also called grits in the American South, where they may be served for breakfast, brunch, lunch, or the evening meal; with just butter and cream, or any number of toppings. 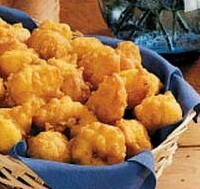 Hush Puppies: Popular during the Civil War, these fried balls of cornmeal are said to have gotten their name from Southern soldiers who tossed them to their dogs to keep them from barking. So from Americas Native Tribes to its early colonists and European settlers, corn and cornmeal have had a very important role in shaping the foods we enjoy today, especially the ever popular Southern and Southwestern cuisines. In the next issue of our series on corn, we’ll explore how corn oil has influenced our culinary world.